Reason for posting: Thiazolidinediones such as rosiglitazone are insulin sensitizers used in the treatment of type 2 diabetes and polycystic ovarian disease. Some patients taking these drugs experience peripheral edema.1 Recent advisories2 have noted that patients may also experience visual disturbances related to macular edema. The condition: Macular edema occurs when the blood vessels leak plasma into the surrounding retina. 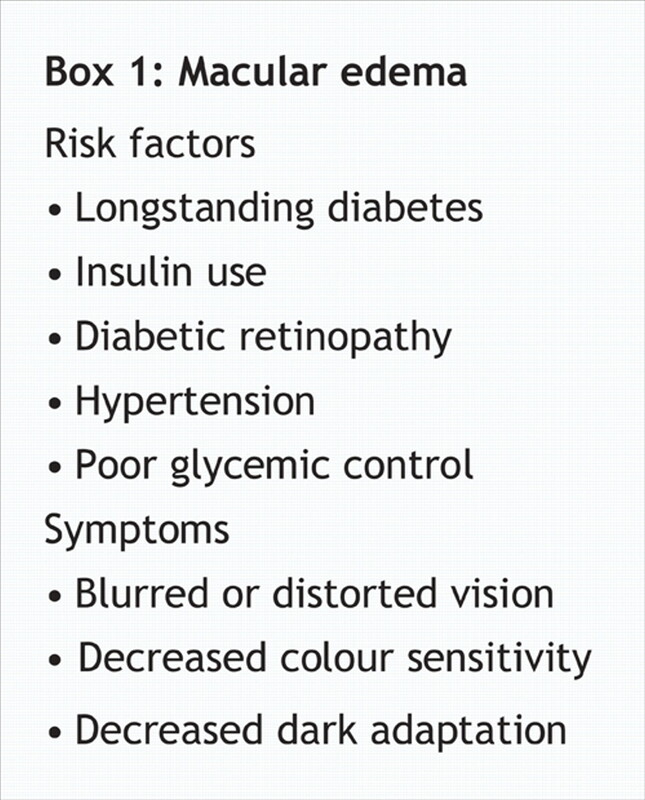 Among people with type 2 diabetes, it can be found in 15% of those who use insulin and 4% of those who do not.3 Risk factors for macular edema and its symptoms are listed in Box 1. Cases of rosiglitazone-related macular edema were first described in September 2005.4 The manufacturer of the drug, GlaxoSmithKline, announced subsequently that the effect had been reported in an undisclosed number of postmarketing cases worldwide.2 Although limited clinical data on affected patients are available from GlaxoSmithKline or Health Canada, most of the patients affected were reported also to have fluid retention, peripheral edema or weight gain.2 Key unreported case details included the patients' ages, duration of diabetes, doses and duration of rosiglitazone use, concomitant medication use and ocurrence, if any, of pre-existing diabetic retinopathy. Some patients improved after rosiglitazone use was discontinued. Health Canada has received 9 reports of visual impairment in patients taking rosiglitazone. Of these, only one was clearly associated with macular edema: a 65-year-old woman who had taken an unspecified dosage for more than a year. Her symptoms, which also included hypertension and peripheral edema (but no retinopathy), resolved upon discontinuation of the drug (Barbara Raymond, Marketed Pharmaceuticals Division, Health Canada: personal communication, 2006). Wooltorton E. Rosiglitazone (Avandia) and pioglitazone (Actos) and heart failure. CMAJ 2002;166(2):219. Health Canada. Association of Avandia and Avandamet with new onset and/or worsening of macular edema [Dear Healthcare Professional letter]. Available: www.hc-sc.gc.ca/dhp-mps/medeff/advisories-avis/prof/avandia_avandamet_hpc-cps_e.html (accessed 2006 Jan 17). Canadian Diabetes Association 2003 Clinical Practice Guidelines for the Prevention and Management of Diabetes in Canada. Can J Diabetes 2003;27(Suppl 2):S1-152. Available: www.diabetes.ca/cpg2003 (accessed 2006 Jan 22). Coluciello M. Vision loss due to macular edema induced by rosiglitazone treatment of diabetes mellitus. Arch Ophthalmol 2005;123:1273-5. Rosiglitazone: Opening Pandora's Black Box?